A majority of Indians express dissatisfaction with national conditions overall. Still, nearly six-in-ten give their nation’s economy a positive rating, and most expect economic conditions to improve over the next year. In addition, more than eight-in-ten say the government is doing a good job dealing with the economy. Concerns about crime, terrorism and corrupt political leaders are widespread; at least eight-in-ten see these issues as very big problems in their country. More than six-in-ten also describe the situation in Kashmir, pollution, illegal drugs, and economic issues as major challenges. Moreover, a solid majority of Indians say that the Maoist rebel Naxalites pose a serious threat to their country. More than half of Indians (54%) are dissatisfied with the way things are going in their country, while 45% are satisfied with national conditions overall. In 2009, a slim majority (53%) expressed positive views of the way things were going in India and 46% offered negative opinions. Yet, despite the overall negative views of national conditions, a majority (57%) describes the current economic situation in India as very or somewhat good. Of the other 21 publics included in the 2010 survey, only the Chinese and Brazilians rate their countries’ economies more positively (91% and 62%, respectively). Satisfaction with the state of the economy is more prevalent among the more affluent and those with at least some college education. About six-in-ten (62%) of those with a monthly household income above 10,000 rupees describe India’s economy as good, compared with much slimmer majorities of those in the middle and low income groups (55% and 53%, respectively). Similar differences are evident across education groups. However, ratings of national economic conditions are considerably more negative than they were a year ago. In 2009, nearly three-quarters (73%) of Indians said their country’s economy was in good shape, while just 27% said it was in bad shape. When those who give India’s economy a negative rating are asked who is to blame for their country’s current economic problems, about nine-in-ten (89%) say the government is among the top culprits; 63% fault Indians themselves, while far fewer say banks and large financial institutions (14%), the United States (9%) or the European Union (3%) are to blame for India’s economic troubles. Still, more than eight-in-ten Indians (85%) say their government is doing a good job dealing with the economy; just 11% say the government is doing a bad job. India’s government gets good ratings among all demographic groups, but positive views are especially widespread among respondents with higher incomes and with at least a high school education. More than eight-in-ten of those who completed high school (85%) and those who attended college (86%) say the government is doing a good job dealing with the economy, compared with 77% of those with a middle school education and 70% of those with a primary education or less. The breakdown by income group follows a similar pattern: Nearly nine-in-ten in the high-income group (88%) and about the same percentage in the middle-income group (87%) give the government a good rating, while somewhat fewer among those in the lowest income category (77%) share this view. 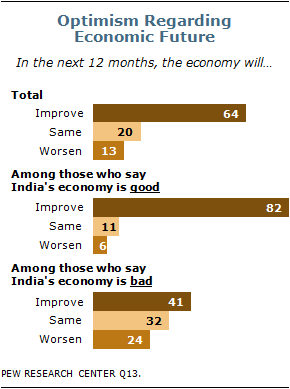 Indians are hopeful that their country’s economic condition will improve over the next year. More than six-in-ten (64%) expect the economy to be better, while just 13% say it will worsen and 20% expect it to remain the same. the next year, compared with a narrow 55% majority of those in the lowest bracket. 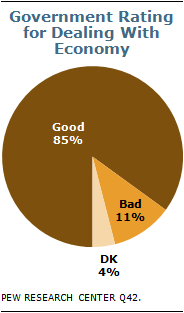 Likewise, 69% of those who attended college are optimistic, compared with about six-in-ten in lower education groups. Notably, those who already think India’s economy is in good shape are twice as likely as those who give current economic conditions a bad rating to express optimism about their country’s short-term economic future. About eight-in-ten (82%) Indians who describe the economy as good expect it to be even better in the next year; just 6% say it will be worse and 11% expect the economy to remain the same. By contrast, just 41% of those who say India’s economy is in bad shape think it will improve, while 24% expect it to be worse and 32% say the economy will remain the same in the next year. Nine-in-ten Indians say that growing trade and business ties between India and other countries is a good thing, consistent with views expressed in Pew Global Attitudes surveys in India since 2002. 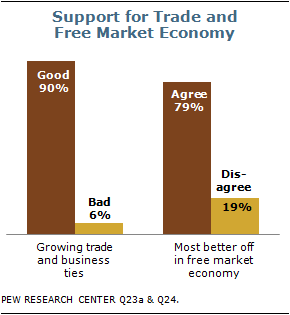 Support for trade is widespread among all demographic groups. with 72% of those 50 and older. About eight-in-ten Indians say crime (82%), terrorism (81%) and corrupt political leaders (80%) are a very big problem in their country. Nearly seven-in-ten (69%) also name the situation in Kashmir as a major challenge, while about two-thirds express similar concern about pollution (67%), illegal drugs (66%) and economic issues (66%). Of the issues tested, access to drinking water and people leaving India for jobs in other countries are named the least frequently. About half of Indians say these issues are major problems in their country (51% and 48%, respectively). Women are generally more likely to describe India’s challenges as major. For example, while 53% of women say emigration is a very big problem, fewer than half (44%) of Indian men are similarly concerned about people leaving their country for jobs in other countries. Women also express more concern than men about economic problems, illegal drugs, the situation in Kashmir, access to drinking water, and the gap between the rich and the poor. Young people are more likely than older respondents to characterize illegal drugs as a major challenge in India. About seven-in-ten (71%) respondents younger than age 30 say drugs are a very big problem, compared with about six-in-ten of those ages 30 to 49 (62%) and those 50 and older (63%). Interestingly, the more affluent are more likely than those in the middle- and low- income categories to describe the gap between the rich and the poor as a very big problem; 61% of those with monthly household income of above 10,000 rupees do so, compared with half of those with household incomes between 5,001 and 10,000 rupees and 53% of those with household incomes of 5,000 rupees or less. About eight-in-ten (82%) Indians say Naxalites pose a serious threat to their country, including 61% who describe the Maoist group as a very serious threat. 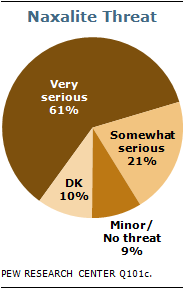 Just 9% say Naxalites pose only a minor threat (8%) or no threat at all (1%) to India. Those with higher incomes and those with at least a high school education are especially likely to consider Naxalites a very serious threat to their country. More than six-in-ten of those who attended college (63%) and just slightly fewer among those with a high school degree (60%) offer this opinion, compared with 53% of those with a middle school education and 46% of those with a primary education or less. Similarly, 70% of those with a monthly household income above 10,000 rupees see Naxalites as a very serious threat to India. A considerably smaller majority of those in the middle- and low-income groups share this view (57% and 56%, respectively).